ive been thinking out about this for the past few days and i cant find any info. did peterbilt ever have a option for 12v71 detroit engines in there needle nose models like the 351 or the 358 models for production and soo on ive never herd of the old needle noses having that engine installed, im trying too dig some info up and i cant find anything. I am not a pete man but were would you put the engine. Eric, I don't know either. I know there was a extended hood 351 with a Caterpillar 1693 like the one Cam Lavin had. If anyone knows he would. Hopefully he chimes in on the proper information. I know for sure the early 70s 359A did have some extended hoods with twelve packs. 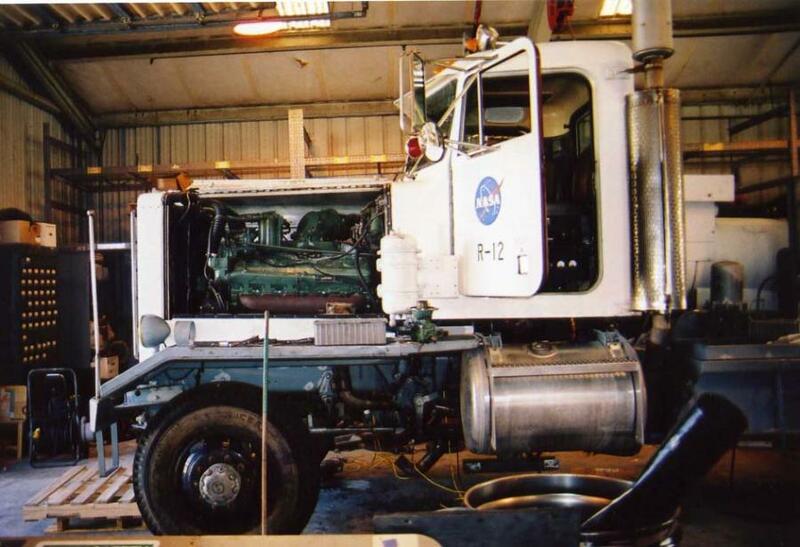 I do remember being at the Fontana 2004 ATHS convention and seing a 1950s butterfly hood Kenworth parked next to our wrecker with a 12v71 horseshoed in it.But I am pretty sure it was repowered. A trucking company out of Minnesota had some narrow Petes with 12V- 71s in them. I seem to remember it was Schano but am not sure. As for extended hood 351 Petes, I had one that came with a Hall Scott. I do not know if all Hall Scott equipped 351s had the extended hood. 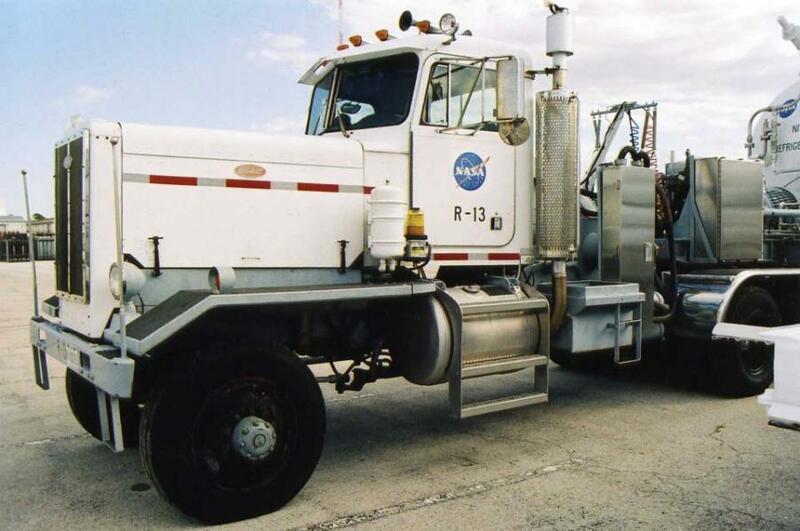 The NASA Petes are 351STL6x6's, and they were built in the late '60's or early '70's. NASA still runs 4 of the original 5 every day. They have all been re-cabbed with the newer style cab with the Corvette dash. They will probably go up for auction within a few years. Eric, good question. I have been looking for them as well and only know of mine, the 75 359 on u tube, the Nasa petes A 73 359 they talked about on here A few years back. It doesent seem like very many survived. It does Seem like the 12v71 Kenworths out number the Petes 2 to 1 I know if I lived in Minnesota I would be looking for one of those Shano trucks. I believe the blue extended hood small window Peterbilt in the Tombstone Run 2009 video has a 12v71 might have been factory. Check it out it comes out in minutes 1:04,3:05, 4:25:5:40. The whole video is so cool. Just realized you are asking about needle noses. Oh well the extended hood small window cabs are cool too. Peterbilt did offer the 12V71 in 351 "needlenose" models. As near as I can tell they made very few. I have the cab off of a '68 351 that was factory V-12 powered. Got the line sheet from ATHS to verify. In Pleasanton, Ken Talley introduced me to a fellow from Canada that is restoring another factory V-12 351. I know of no others. I think the 1693 powered 351's (and 1676 repowered 351's) had a 125"BBC. The 12V71 351's had a 127" BBC. I also would be very interested to see one of these trucks! Fred, the rust mites got to them I'm sure, nearly all NASA's vehicles at KSC sit outside and the salt air is not kind to them. 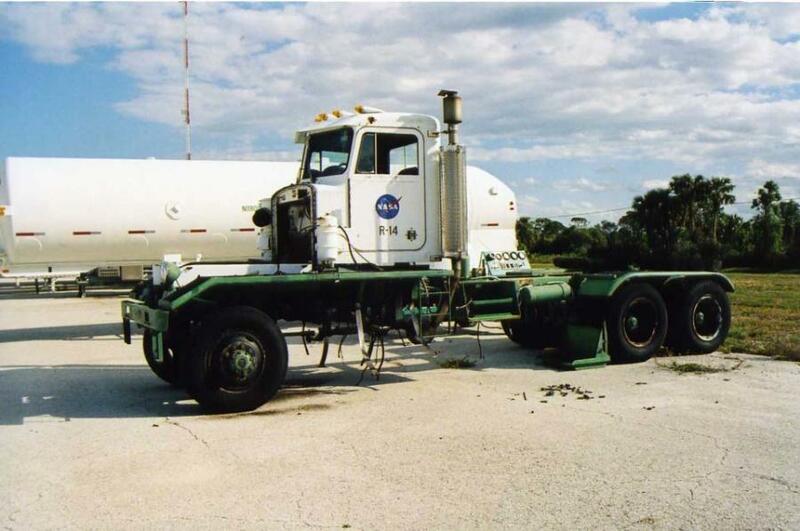 The 5th truck was parted out and auctioned off a few years ago, there was only the cab, fenders, and chassis left. They kept the engine and transmission, I don't know what happened to the nose. If the extended hood 351 Pete had the thin radiator it measured 125 inches bumper to back of cab. If it had the thick radiator it measured 127 inches. The side pieces on the grill of the thin one had 2 bolts at the top, the thick radiator one had 3 bolts. Jeff- what's the little muffler on top of the exhaust? Spark arrestor? man thats nice i wonder how much a truck like would go for brand new ordered from peterbilt back in its day? hey by the way fred did u ever pick ur 359 yet or is still tucked away in the sellers barn? That peterbilt is like mine except mine has the 127" bbc a taller bumper and the four headlight setup. It has a short wheelbase and the fuel tank/step with with battery box behind that and the spoke wheels. I am going to use this paint scheme on my truck so mine should look just like it. It is still in the barn, I am going to be building a shelter for it very soon and bringing her home. Its in a safe place right now and out of the weather.I will do a post on it when I bring it home. 12v71 how long is the engine front to back i"m working on a autocar a10264 and would like to put that engine in there. the truck needs part going to another truck to make one nice old truck. Over all length including fan and flywheel housing 62"
The only time that video sounds anything like a Detroit is when it backs toward the trailer . Jeff-----Keep in mind that a flange mount air compressor will extend another 6-8 inches behind the flywheel housing mounting face . Execution: 0.125. 3 queries. Compression Enabled.